Update 1: A couple of people seem very concerned with pointing out that Jeff Fugate himself allegedly had nothing to do with this sign being put up and ordered it taken down once he discovered it. In reality, it doesn’t much matter to me who was the actual person placing the letters on the sign because it shows a mindset that is pervasive and promoted through fundamentalism. I applaud whoever it was that finally had the honesty to make a public spectacle of their hatred of their fellow man instead of keeping it inside the church walls where it usually resides. Imprecatory Marquee’s: Specializing in promoting a judgmental, mean-spirited, petty god of vengence via weekly zingers that are a surefire way to draw the masses so the pews are full to over flowing each week. Is “haymen” the way amen is said in a Hyles church? It’s the way it is said in many IFB churches. The preacher ends a statement with a simple amen? (emphasis on raising his voice at the end). Which is a cue for the amen crowd to start hooting and hollering and shouting Hay-Men! Some will drag out the “hay” part. Others will say it as quick as possible. This is done not only to agree with the preacher but to stroke his delicate ego. It’s like holding up an “Applause” sign. The church I attend now, the pastor does often say, “And all God’s people said…” but only after a song or special. Never during his preaching. Thanks. The only exposure to a Hyles church I had was doing extension work at one in Milwaukee WI when I was attneding MBBC. I went there for about a semester or so and I had only been saved for about 3 years so it was a new experience for me. I understand the Haymen now. This pastor was actually an MBBC graduate who turned Hyles. Here is where I went and wow, would ya look at the big new church! When I went there in 93, we were meeting at a broken down school downtown and Noonan was the same pastor. I’ll have to look over the site more but it looks like it’s still Hyles-ish. I remember when I left MBBC, they were going to “uncheck” this church b/c he went Hyles. I like my current church very much, but the pastor (normally a very humble person) apparently picked up a bad habit somewhere in his past of asking for “Amens” during his message; usually 3-4 times a message. I agree with the pastor above — that if you have to ask for an Amen, you probably didn’t say something worthy of an Amen. I remember his brother very well and he was the one who was very irritating and belligerent in the pulpit. It doesn’t surprise me he split the church b/c I got the vibe he was jealous of the brother. The Bob Gray in TX is a different man. You are thinking of the Bob Gray from FL. The one in TX has his special set of issues but I am not aware of any allegations of child molesting. Hey, that’s Jeffery’s church. I didn’t get to hear him preach at SOTL last year, he only did a daytime sermon. But he’s the Bus ministry Guru who taught the “How to run a Bus route” sessions at SOTL. Love the open letter. The letter writer is dead on. Thanks for posting that link, Don. I’m glad he wrote that letter, I feel he did it very respectfully. It kind of amazes me how hard it is to find on their where these churches are located on their websites. I did find it on the Contact page, but you’d think they’d want to make their location clear and obvious from the get-go. I get the feeling most church websites are unintentionally designed for the people that actually attend, and not the people seeking the church out. It is actually work to envision what an outsider might be looking for online. I know this happened to me, having helped once do this here in Canada. I think this is the norm for a lot of churches. We’ve moved around quite a bit, so I’ve spent my fair share of time researching churches online. Most make it rather difficult for you to find out when and where they meet. Wow 😯 Was This a reader submitted photo? If they really been concerned about the thieves’ eternal destinies then they would have put a Chick Tract in a waether-proof baggie taped to the AC unit for just such an occasion. That way they could have put on their marquee: “To Whomever stole our AC units… “Read the Tract!” Call us when you get saved. or even a weather-proof baggie… I shall now go and taunt george for his typing sins. George is immune to Taunt like Onyxia the dragon queen in World of Warcraft. Both will give you their undivided attention whether you want it or not. I wonder if George also has whelplings? Deacon: Pastor, that was a fine sermon but I’m dissapointed that you didn’t really lay it to them when you got to the 8th Commandment? What happened? Pastor: I know, I was a’goin’ to, I mean I had me a head of steam, and was gonna preach hell hot and wide open. Deacon: So, why didn’t you? You have my coworkers looking at me as I laugh. The sign is sadly lacking in punctuation, but I am pleasantly surprised that they didn’t use “your”. Just look at those Honorary Doctorates and who gave them to him. We saw an average of 1,250 riders per week on the buses in April. Scores saved. Praise God for the bus workers of America who love the unloved! Let’s keep those buses rolling. Last one and I’m done. Crud. I have 27 friends in common. I need to scrub my friends list. I was looking, I mean creeping (have to use the youth term) at his pictures. Saw a post from a “pastor”, so creeped on his page, and followed a link to his church. Clicked on “About Us” and the whole page was about him! The other info was on the side! It’s all about the pastor. He didn’t condone the message. He was actually quite furious about the sign and it was taken down after a few hours. This man has a heart for people. He talks about a ores being saved, because he cares about souls. Jeff Fugate will cry from the pulpit while recounting the story of a drunk or a druggie getting saved. And when he says the unloved, he’s referring to the children who come on the buses believing that no one cares about them. You would be surprised at the heart break of the little ones. Who will care about them if no one tries to help? He loves people. Everyone tries to find a fault in a preacher. One other side comment, just because the congregation doesn’t say amen, doesn’t mean that the statement wasn’t deserving of one. Ever have a preacher say something that convicts you, and you sit in silence and awkwardly squirm on the inside knowing he is right? Gods Word is what is right. And if you can’t take it for what it says,, why say you believe it at all? That makes him Doctor Doctor Jeffery Fugate. Actually, zero times zero still equals zero…lol. Exactly, I think even Shoes would agree on that one. I think the great Dennis Corle has 4 or 5 Doctorates. So he has been properly doctored? Ooh, I wonder why/when Dr Jorgensen left HAC. I’m friends with his wife on facebook. Oh, wait, my mistake. I was thinking of someone else. I get all those people mixed up. Where is Seen Enough and her photographic memory when I need her? I was wondering where my pal Seen is, too. I’m so glad this church doesn’t have any wimmen on their staff. I guess they have preacher boys answering the phones or making copies. Call the office. You’ll get your phone call answered by a WOMAN. Whenever I see statements like that, I’m reminded of why we left. We don’t have to “perform” anymore. Getting better use than they would’ve had at the pictured church anyway I’m sure. *for. Georger is mad because I wouldn’t take him on the cruise. Well you have to admit this is an unusual sign for people to see as they’re driving by. More interesting than the usual hum drum of their service times or some other trite saying like “7 days without prayer makes on weak” or some such. People will notice this sign. There is a story behind it, not that it excuses it in any way. 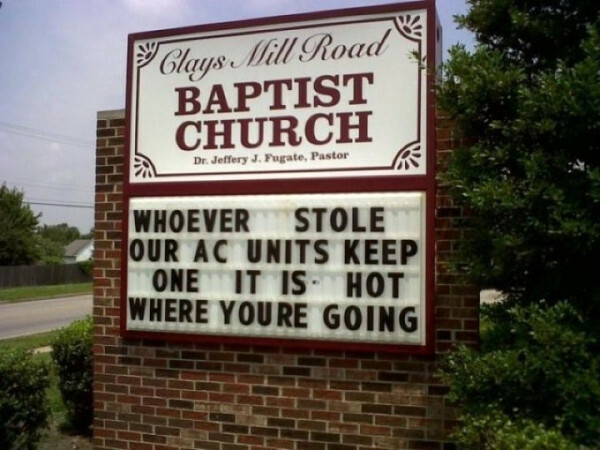 Someone stole the AC units off of one of the church buildings. A member of the pastoral staff (I’ll let them remain anonymous but I do which one and it was not Jeff Fugate) took it upon themselves to put this message on the church sign. It was up I am told for only a few hours before phone calls and media inquiries started pouring in. Fugate was not aware of the sign until this point and had it taken down immediately after finding out about it. Too late, since pics of sign are all over the internet popping up on humor sites and such. I was wondering how long it would take for it to pop up here. We walk a fine line between ridiculing signs such as these simply to feel holier-than-thou and noting an aspect of fundamentalism we used to buy into but now realize was less than Christian-like. If your account is true, then I would expect that the person who put up the sign got “taken down” a bit along with the sign. I hope. That is inexcusable. I’ve got connections there. Not as good as I had a few years ago but still I occasionally get the inside scoop on things there.. This is not a recent event and happened a year or two ago. What I said can be backed up by a number of people “in the loop” there. Fugate had nothing to do with the sign except for having it removed. A member of the pastoral staff acted on his own in putting the sign up. Fugate and his ministry have become quite controversial in Lexington and Kentucky. This didn’t help matters. He’s very involved in political issues in the state. Just do a search for the “I Love America” patriotic rally in 2002. @JoeR: Certainly the pastor should have a talk with him… it was a lapse of good judgment. I know many people who would think only that it is funny, and not consider the larger picture. There’s no need to come down unnecessarily hard on the staff member unless he shows repeated and consistent violations. By “taken down” I mean in the sense of “taken down a peg”. I don’t mean that he should have been fired or caned. The offending pastor should definitely have apologized for the action. I guess I’m surprised the pastor doesn’t have to approve all saying that are posted. Most pastors control ever detail that involves HIS church. Oh it just isn’t fundy pastors that do that. I work at a United Methodist Church and the pastor has to read over the weekly news emails that I send out to our children and youth families. She says it’s to make sure I have correct grammer. Matt, thanks for posting the “real” story. We do tend to be quick to rush to judgment. People are stealing AC units because of the copper inside. Churches have been especially vulnerable due to lower security and perhaps shorter ‘open’ hours during the week. I wonder if the thieves tithed when they got the cash from the scrap metal dealer? One small church here in the Greenville area got hit three or four times last summer. After that, they put in a camera and focused it on the AC unit so they could catch the guy. The SC state law governing selling of scrap metal have changed over the past year or so; now you have a permit to do it. I think it’s brought down the number of copper thefts significantly. In our area, it is a common thing for houses that are empty or being built to be broken into and all the copper pipes and wires stolen. Same thing, maybe a couple hundred dollars worth of copper for the potential of years in prison for breaking and entering and receiving stolen property. I know we must have visited this church on deputation. I heard my dad say this name a lot. But I don’t remember anything more than that. We saw one sign the other day that said…”If God is your co-pilot, switch seats.” Yeah. Baptist don’t have a sense of humor or when they try to have one, it just comes across as stale an/or dorky. We tried that same church and the pastor was a BJU grad. I got into an argument with his BJU wife when I told her I didn’t agree with the stupid rules b/c treating someone attending college like a kid is stupid and wrong. Of course, she stated that she needed the rules blah blah blah. Well. Punishing everybody is wrong and that’s another discussion too. One breaks a rule and everyone gets more rules added on to the handbook. LOL. I attended Maranatha Baptist in WI and they had a handbook AND a Freshman class that was a semester long about the handbook/rules. Is anyone familiar with The Brazen Bull? I wonder if they sign-poster would himself sentence the thief to this “punishment”? If not, why? Isn’t that what he thinks God is going to do – only for ETERNITY? What strikes me as strangest about this sign isn’t so much the judgment of who is going where in the afterlife as the notion that the thief, or anybody, can take an air conditioner along to his/her/their eternal destination. If I can bring one with me, what kind of current do they use there, 110, 220, or some other voltage? And are there HVAC repair people there? Me? I want a 9 ft concert grand piano to play in heaven and I’ll even play CCM, country and any other request. I’d also like to play a song with John and June Carter. You ask for an amen?…..The audience responds with a Hay-Men!!! Thank God that there will be at least one AC unit in hell, the MOG has forseen it. I know of at least one HVAC technician who I used to deal with in a previous career who will be there to service it. Are we forgetting that somebody committed a criminal act by stealing the AC units? The ones at our church cost around $10,000 a unit and we have three of them. I can fully understand the anger. Thieves should be dealt with as harshly as the law allows, which is not harsh enough in my opinion. For the record, I hope the dirty thief or thieves get caught and punished, and I hope the church gets its air conditioning equipment back. Anger/irritation, yes, I can understand. Condemning someone to hell because of their actions? No – I’m no better than they are, and I deserve the same. Yeah that’s what Jesus said. If they couldn’t let it go…aka “turn the other cheek” like they tell us to do…then they could have at least used “Bible language”. Let them that stole, steal no more, but rather let them WORK! Actually? I thought it was darned funny. Pastor Fugate received two honorary doctorate degrees in 1997: a Doctorate of Divinity from Oklahoma Baptist College in Oklahoma City, OK and a Doctorate of Humanities from Hyles-Anderson College in Crown Point, IN. So according to FB this guy graduated from H.S. and TTU in the same your (1982)?? His Bio on his church’s website doesn’t list any sort of earned degree. He has no earned degree. He attended Tennessee Temple for s short time before leaving to help his father who was a pastor in Hazard, KY, and had cancer (he died not too many years later). Had basically same story at Hyles Anderson from what I gather. I don’t recall him saying that much about either place. Actually on Jeff’s bio from the website it says, “Not long after his father’s passing, Bible Baptist Church called Pastor Fugate to be their new pastor.” If you notice, it carefully used the words ‘not long after’. That’s because Sam Fugate had already hand picked a pastor from the area by the name of Mike Ison to pastor the church. Mike did pastor the church for a period but the congregation would have nothing to do with anyone other than a Fugate. It was most definitely a Fugate empire. They were furious to the Ison family! Mike Ison is now an insurance salesman in Lexington, Ky. And a very fine man as I recall. Somebody’s really trying (and failing miserably) for something humorous to say. But he leaves out every other pastor. Bro. Gene Holmes was the next pastor. He is one of the true leaders for Christian schools in Ky. There was a period when Lexington Baptist Tabernacle joined with Clays Mill Road to save the church from bankruptcy. The pastors were Rex McPherson & Tom Lester. The attendance the first Sunday from CMRBC was 13. Had Bro. McPherson and Bro. Lester & the congregation of 60 not voted to join up with CMRBC, there would be NO CMRBC! Lex. Baptist Tabernacle congregation kept them from bankruptcy! The church continued to thrive & build to about 350. Then Rex left to go to the mission field when they called another Pastor. C.M. Carruthers was the next pastor & no doubt he had his trouble. He is best known as a hireling among most churches he has pastured. He destroyed CMRBC embezzling money & not keeping his hands to himself. Yet none of the deacons had the GUTS to prosecute! He eventually left. Not sure how or why it was only after he ran everyone else off leaving the congregation to less than 20. He is out of the ministry now for fathering children with younger ladies while he was married. C.M. Carruthers is back in the ministry as a pastor in Florida. If the things you say about him are true I doubt his new church is aware of his past. Correction on that CM Carruthers comment – he is pastoring again in Ormond Beach FL with the woman he fathered a child with out of wedlock while still married to his first wife. Don’t think that church knows he was married before nor about him running off people in previous churches…..Check it out under his name on google! @Duke. I have very interesting information regarding your post. Can you PLEASE email me at: shannonwhite033@gmail.com I really need to share it with you and I can explain everything in private email. Duke, where in the world did you get your information??? CMRBC had less than 50 regulars when I took it, we gave money from our own pockets to bring it in the black and NEVER took a dime that was not designated to us nor was there an accusation of such or ANY wrong doing. During those 3 years we were there many were saved and baptized and the attendance was well above what it had been for years before. The congregation did come down the last several months, they all begged me to stay. There was NO wrong doing involved whatsoever. Lexington Baptist Tabernacle joined with Clays Mill Road to save the church from bankruptcy. The pastors were Rex McPherson & Tom Lester. The attendance the first Sunday from CMRBC was 13. Had Bro. McPherson and Bro. Lester & the congregation of 60 not voted to join up with CMRBC, there would be NO CMRBC! Lex. Baptist Tabernacle congregation kept them from bankruptcy! The church continued to thrive & build to about 350. Then Rex left to go to the mission field when they called another Pastor. Be careful Chuckie. I know too much. I know a lot about Marion, Iowa, (I called them shortly after you arrived) & W.Va. All about your present wife and just how THAT came about, your first wife & boys, Ormond Fl, and a whole lot more! And to make it clear I do not speak to your family. I made a vow after you left CMRBC you would never hurt another family like you hurt mine. You messed with the wrong person. By the way, no one could beg you to stay as you left in the middle of the night in the brand new Cadillac purchased by the church that YOU promised to pay for! Perhaps you need to quit before I reveal too much. sadly Carruthers and his wife ran off anyone at the church in Ormond that cared and have changed the name of the church within a year. I would really like to know more information on this man. I attended the church in Ormond Beach, FL(no longer). But the people there have no idea about the things of Carruthers Past. Mr. Cloers if this is you I am wondering why you left the church when it appeared you were M. Carruther’s right hand man and participated in attempting to have long term church members that disagreed with Carruthers thrown out. Is this really Michael Cloers? Were you that surprised by this information? Can you contact me at editor@ormondbeachobserver.com? That is hard for me to read. I was a member of a forum where one of the members had the username “God” and he acted like it, except he was not a Christian by any stretch of the imagination. He as rude, arrogant, crude, and disgusting. So anytime I see someone taking the name of God, even in jest, it makes me shudder. I actually find this kind of funny. I don’t think it’s a good testimony or right to do, but the irony and wittiness is there. Only problem is the units won’t work because they need to be plugged into THE power source! Pardon me Darrell, but maybe you should attend said church before assuming that they preach hatred of others. On the contrary, it is preached to hate the SIN, love the sinner. I’m surprised you never suspected there was a problem with Carruthers Mr. Cloers when you participated in attempting to have long time church members thrown out of a business meeting at the church by the police. Do you not question bizarre behavior? Trying to get info on Michael Carruthers. Questionable minister?????? Attend his church in Ormond Beach, Fl. He is a scum bucket. I need ammunition to get him out of ministry. He’s ruined and is ruining any lives. HELP !!!!!! wow JC sounds like either Carruthers or his wife how would JC know about emails sent to Carruthers? Scam man still at it. The lack of education shows through in ridiculous allegations regarding a professional “servicing” church members. Of course Church members voted for a lie because a liar applied for the job. The church thought they were hiring a minister but they hired a used car salesman. please note that jc’s comments have been passed on to the two indivduals that were slandered in her comments. What about Dan Cregan, Ormond Beach folks?